Ask almost anyone with problematic skin and you’ll hear talk of the sea of blackheads they have on their nose that they just can’t seem to get rid of. Even if they squeeze them and see satisfying little bits pop out, they come right back! They’ll use pore strips and see the little specks on them afterwards, but in two days they’re just as bad as before! Why are they so stubborn? Sebaceous filaments are grey, yellowy white or black collection of “bacteria, sebaceous lipid, corneocyte fragments and hair” that sit inside our pores. In simpler terms, it’s dead skin, hair and oils. Once they’re removed, they resemble a little fine cone shaped strand which is where they get their name. They help carry oils out from the oil gland to the surface of the skin where it’s needed. They’re visible because as our skin oils spend time in the air and oxidise, they turn dark. As you enter puberty and your skin gets oilier, the appearance of these guys increase. This leads many teens to think they have blackhead problems. It doesn’t help when skin care companies advertise products like pore strips, baking soda scrubs (I’m looking at you, Biore) and peel off charcoal masks. They often use images of a nose covered in normal sebaceous filaments to represent ‘dirty’ skin and because of this we have a warped perception of what’s normal. 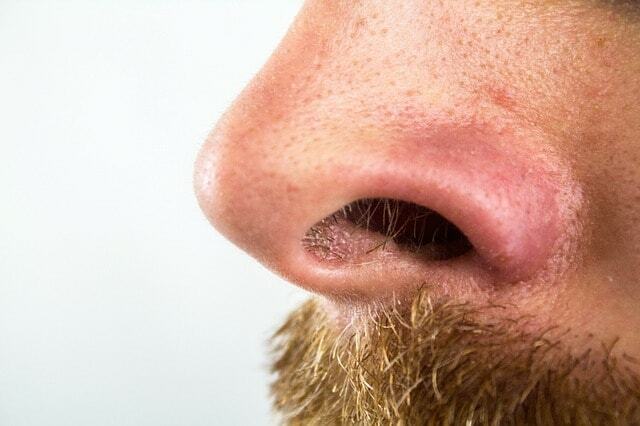 This is a perfectly normal nose with sebaceous filaments. His nose actually looks pretty good! They can be a lot more visible than this. Note the even spacing and repetitive pattern, characteristic of sebaceous filaments. You can tell them apart from blackheads because sebaceous filaments look like a pattern of repetitive dark pores across the oilier parts of the face. This is most often the nose, chin, cheeks and forehead. Blackheads, which are an abnormal blocked pore, are a much darker black and usually come alone or in small groups. Sebaceous filaments can be found on almost every single person’s face. They are part of how our skin naturally lubricates and sheds itself. They are constantly growing and regenerating. Some people’s might be more visible because of natural body chemistry or genetic pore size, but if you’ve got pores then you’ve got these. Because they’re mainly made of oil, the oilier your skin the bigger they might be and the faster they might come back. WHY WON’T SQUEEZING/PORE STRIPS REMOVE SEBACEOUS FILAMENTS? Sebaceous filaments are collection of our skin’s natural debris and as such they are going to keep coming no matter what you do. When you remove them, they will just fill back up again in a matter of days with new skin and oil. Unlike blackheads, they are not a blockage that needs to be removed but rather a recurring collection of the latest stuff our skin has produced. Squeezing isn’t worth the damage it can do to your skin. HOW DO YOU REDUCE THEIR APPEARANCE? Lots of people (myself included) swear by the oil cleansing method to loosen up gunk like sebaceous filaments. The theory is that ‘like dissolves like’ – so you can dissolve the oils on your skin using a carrier oil (my two favourites are Jojoba oil and Squalane oil) or an emulsifying oil like Softymo Speedy Cleansing Oil that rinses clean. Gentle massage will loosen the filaments up and if you’re lucky, you might feel ‘grits’ pop out; tiny filaments that feel grainy like sand. This can then be followed by your regular cleanser to remove the oil residue, and then finish up with the rest of your routine. Salicylic acid aka. BHA (beta-hydroxy acid) is an ingredient known for its pore cleansing and anti-acne properties. It can dissolve and remove the keratin that makes up our dead skin and hair and is oil soluble too so it gets right down into the pores. BHA is applied straight after cleansing, left to dry, then followed by moisturiser. Stridex is a popular choice because it’s affordable and at the correct percentage and pH to work properly. Currently I am personally using CosRX’s BHA Blackhead Power Liquid. When used regularly, salicylic acid will keep sebaceous filaments to a minimum and also prevent new acne and blackheads from forming. Doing all three of these techniques as part of a regular skin care routine will keep sebaceous filaments to a minimum. Just remember that skin isn’t supposed to look flat and airbrushed up close – pores and sebaceous filaments are part of normal, healthily functioning skin! So stop steaming your face (because pores don’t open or close) and trying to squeeze these guys out. As always I hope you enjoyed and learnt something from this post. Tell me, are you guilty of squeezing your sebaceous filaments? I used to be! Let me know! PS: If you enjoyed this post and want more, I think you’d love my FREE beginner’s skin care guide! It’s got step-by-step instructions and tons of product recommendations to get you going on your skin care journey! Check it out here.